Fourth of July weekend is drawing near, which means around the country people will be celebrating with friends and family at picnics, barbecues, pool parties, and of course, viewing some firework displays! The tradition of celebrating our country’s independence dates all the way back to the 18th century and the American Revolution, although it didn’t become a federal holiday until 1941. Today, the Fourth of July is considered one of our most important national holidays and is a symbol of patriotism. Here’s a fun fact: it’s estimated that consumers spend over $600 million dollars on fireworks for the Fourth of July, with two-thirds of that going to backyard barbecues! On July 4, head to Centennial Olympic Park after 6pm for fun and entertainment for the whole family. This Fourth of July event in Atlanta features not only free music, but also the Southeast’s largest fireworks display! This fun-filled Fourth of July Atlanta event features activities the entire family will enjoy, with vendors and artist markets, a kids’ activity zone, entertainment, and delicious food and beverages. Plus, the evening is capped off by a spectacular fireworks display! Head to the Georgia Aquarium on July 3 for their Summer Beer Festival held in their magnificent OceansBallroom. You’ll enjoy unlimited beer, food, and live music while taking in over 500 aquatic species including beluga whales, manta rays and whale sharks. This event is for those 21 and over, and don’t forget to arrange for safe transportation home. Fantastic Fourth Celebration at Stone Mountain From July 1-4, Stone Mountain Park will host their annual Fantastic Fourth Celebration, which was votedthe “Best Place to see Fireworks in Atlanta” by Atlanta Journal-Constitution readers. You’ll also get toexperience the Lasershow Spectacular in Mountainvision®, an amazing show that features the base ofthe 825 foot mountain shining up like fingers of light. Callaway Gardens 4th of July Beach Party Callaway Gardens holds a Fourth of July event in Atlanta that starts early in the day and lasts well into the evening hours at Robin Lake Beach. Wear your red, white and blue gear and get ready to enjoy anentire day’s worth of live music, beach activities and the annual Fireworks Extravaganza! 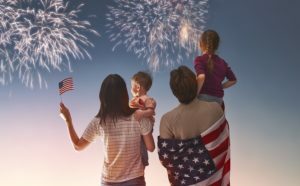 For over 50 years, Lenox Square has been celebrating the Fourth of July in Atlanta with activities for the whole family, including musical entertainment, food concessions and a 15 minute show featuring over 10,000 fireworks! Happy Fourth of July from Storage World! Storage World would like to take a moment to say Happy Fourth of July to all our tenants of the past,present and future! We hope you have a wonderful long holiday weekend! Remember, Storage World has three Atlanta self storage locations that can serve any of your residential or business storage needs!